© POOL/REUTERS U.S. Secretary of State Mike Pompeo accompanied by North Korean Director of the United Front Department Kim Yong Chol arrives at the Park Hwa Guest House in Pyongyang, North Korea, July 6, 2018. 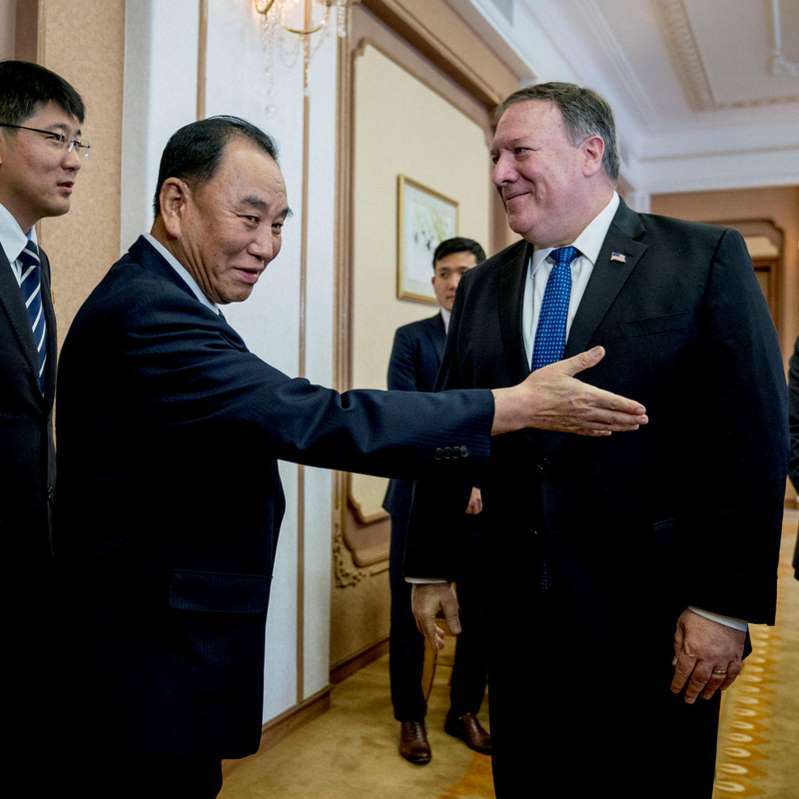 Given the Trump administration's goal of a complete, verifiable denuclearization of North Korea during President Trump's first term, Secretary of State Mike Pompeo is eager to maintain U.S.-North Korean engagement. As he prepares for upcoming discussions with the North Koreans, he is leaving one tool conspicuously on the table: the prospect of an official declaration to end the Korean War. "It's hard to know. I don't want to prejudge precisely where we'll end up," Pompeo said this week when asked if President Trump and Kim Jong Un could sign a declaration to end the war at their next summit. "But make no mistake about it, there is real progress being made." By leaving open the possibility, Pompeo is affirming that the U.S. is open to some form of negotiation with the North Koreans to achieve denuclearization -- and he's showing up armed with more than just demands. The Trump administration, which argues its efforts have averted war, insists it will press forward with the conversations with North Korea after a late summer stall in the dialogue. Mr. Trump has said his next meeting with Kim will happen "in the not too distant future," at a "location to be determined" -- but not Singapore. Until there is "final, full-verified" denuclearization, Pompeo says crippling U.S. sanctions against North Korea will remain in place, but the U.S. is using the prospect of a potential end of war declaration to keep the North Koreans at the table. "The declaration to end the war is inevitable," says David Maxwell, a senior fellow the Foundation for Defense of Democracies who previously served in the US army in Japan and South Korea. He argues that both North and South Korea want it, and they can initiate it on their own. "We have to figure out how to make that a positive event so that the U.S. can use that to the advantage to strengthen the U.S.-South Korea alliance and to continue to push North Korea towards continuing to denuclearize." Kim Jong Un, according to South Korean President Moon Jae-in, said during their last meeting that North Korea would dismantle a major nuclear facility if the U.S. takes unspecified, "corresponding" measures. A formal end to the war is one measure the North Korean regime definitely wants. Critics warn that making such a grand barter with Kim may, however, only lead to even greater demands from North Korean negotiators. Other, more distant desires of the regime beyond a declaration ending the war include a formal peace treaty with the U.S., which could then see American forces removed from the Korean Peninsula. A complete U.S. military withdrawal has long been the goal of the Kim regime, and its ally China would likely support all related initiatives as having thousands fewer American forces in a neighboring nation would be seen as a boost to Beijing's regional power. "We have already given up a lot, and North Korea has done very little. We have already damaged the military readiness by suspending the military exercise that is really to be conducted every summer to maintain the baseline readiness," says Maxwell. "We are falling into the trap that we have the last three decades, that is we have to give up something and North Korea does nothing." Duyeon Kim, a nuclear and Koreas expert at the Center for a New American Security, says the North Koreans would likely tout a declaration ending the war as the "ultimate defeat of the U.S.," to their domestic audience, at least. The question is what the U.S. could possibly get in exchange for signing such a significant document. "I would like to see a proportionate bargain, and it means that the North would have to give something substantial," she says. "If an inventory of their program is the only bargain they are willing to make, then I would suggest that the administration insist on a list of all fuel cycle-related facilities and materials anywhere in North Korea." For his part, Kim Jong Un has taken measures to keep the process moving forward, telling Moon at their summit that he would allow international inspectors to verify his country's "permanent dismantlement" of a key missile facility. The details of that have yet to be hammered out, but the overture was welcomed by the Trump administration. "For DPRK (North Korea) to denuclearize in one year, the U.S. and members of the IAEA (International Atomic Energy Agency) will need access to the DPRK," an administration official told CBS News earlier this month. While National Security Advisor John Bolton has said North Korea could be denuclearized within a year, Pompeo is more conservative, saying the effort will be completed by 2021. The administration will not give a firm timeline. It is also unclear what actions, inactions or demands from Pyongyang might prompt the Trump administration to walk away from the diplomatic process. This week at the United Nations General Assembly, Mr. Trump shed some light on his administration's current posture regarding the North, telling reporters, "We are in no rush. There's no hurry." In his speech to the gathered world leaders, Mr. Trump said his administration had, "made more progress than anybody's made ever, frankly, with regard to North Korea." It was a pivot from the frustration the president showed with the negotiations earlier this month, when he cancelled a planned visit by Pompeo to North Korea, citing a lack of progress. While the White House has committed, just weeks later, to another Pompeo visit, and it appears to be planning for another Trump-Kim summit, it has not mentioned any particular changes in terms of North Korea's movements toward denuclearization. The administration did react positively to Moon's meeting in Pyongyang, and there have been letters from Kim Jong Un to Mr. Trump which the president has described as "beautiful." "I think we will make a deal," Mr. Trump said on Wednesday. He then softened his pronouncement with an element of doubt; "Will we make a deal? I don't know. I think so."